CLOVIS – Fewer than 2,000 tickets have been sold for the St. Jude Dream Home Giveaway. This year’s house will be located in the De Young CountryCourt community in Clovis. Individuals who reserve tickets by Friday, September 20th will also be eligible to win the Early Bird prize, gas for a year, valued at $3,000, courtesy of Fresno Moving and Storage. A limited number of $100 tickets are available for the St. Jude Dream Home, which has an estimated value of $425,000. Winners will be announced during the live St. Jude television special on KMPH FOX 26, airing Sunday, November 10, 2013. Proceeds from the giveaway will benefit St. Jude Children’s Research Hospital, the nation’s leading pediatric research hospital. “We strongly believe in our responsibility to help others, and our entire De Young team is grateful to our community’s continued support of our business so we are honored to be a donor and builder of our seventh St. Jude Dream Home,” said Paula De Young of De Young Properties, the home’s major donor and builder. Tickets can be reserved at all Fresno County Federal Credit Union branches, Fresno Coin Gallery locations, De Young Model Home Centers or by calling (800) 543-5887. 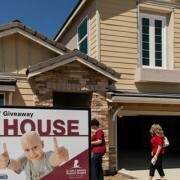 For more information about the campaign visit www.dreamhome.org. Giveaway sponsors for the 2013 campaign include KMPH FOX 26, De Young Properties, 106.7 KJUG Country, Univision Radio, The Fresno Bee, Business Street Online, Ashley Furniture HomeStore, Fresno County Federal Credit Union, Fresno Coin Gallery, Hampton Inn of Clovis, Alpha Delta Kappa, Epsilon Sigma Alpha and national sponsors Shaw Floors and Brizo.